Proven in the field, the open standards-based CBOSSrtb delivers rapid return on investment by enabling service providers to reliably charge for delivering rich revenue-generating services. And it does so while laying the groundwork for supporting emerging communications technologies and services that are already on the horizon. CBOSSrtb implements multiple charging models (bearer, event and session based charging) through industry supported standard online charging protocols and interfaces. The solution enables multiple payment methods (prepaid, postpaid or hybrid), and supports the enforcement of real time credit controls and policies to minimize revenue leakage. CBOSSrtb also boasts full support for MVNO business models with multiple such installations worldwide. CBOSSrtb is a high end real time online 2G/3G/LTE charging solution which implements mechanisms across the circuit-switched and all IP-based network service domains. CBOSSrtb implements a charging process where charging information can affect the service being rendered in real time; it effectively acts as the OCS component of the session/service control point. CBOSSrtb exposes real-time interfaces for interaction between the OCS and network elements to facilitate the authorization and reauthorization of resource or service usage in real time prior to the actual service delivery. CBOSSrtb utilizes NonStop Blades platform that is optimized for affordable cost, with proven benchmark performance. The NonStop Blades platform doubles the performance in half the footprint while providing the same trusted 24/7 NonStop availability, scalability, and data integrity. With true real-time rating and billing of voice calls, SMS, MMS, 2.5/3/4G data, and mobile commerce transactions, the CBOSSrtb solution helps network operators, service providers and MVNOs to generate new revenue streams. All operations are performed in a secure and cost-efficient way, eliminating risks of fraud and bad debt related to value added service usage. In order to gain operational efficiency, CBOSSrtb seamlessly integrates pre- and postpaid wireless billing, allowing anything from purely pre- or postpaid accounts to flexible hybrid accounts. The calls can be paid from either caller’s personal prepaid account or corporate postpaid account. Whatever the payment option of choice, CBOSSrtb enables operators to provide equal services and usage possibilities for all customers. The unlimited rating possibilities enable the operators and service providers to tailor services for each customer segment and create ad-hoc marketing campaigns, including innovative promotions, crossservice discounting, bonuses and loyalty schemes. As new rating rules can be applied in real time, pricing can easily be adjusted to answer rapidly changing market needs. CBOSSrtb account structure allows an endless range of loyalty programs and lets operators bundle and promote service packages to targeted groups. Big and often high value transactions are typically charged to the prepaid account using account reservations; m-commerce and WLAN services can thus be offered safely without the risk of subscribers exceeding their prepaid balances or post-paid thresholds. CBOSSrtb reserves the funds or other resources from the account before they are actually used until confirmation of a successful delivery is received. Then the reserved amount can be conclusively debited from the account. CBOSSrtb integration with the billing and customer care system CBOSSbcc enables versatile advanced management tools for prepaid and postpaid services. The solution provides the full range of application programming interfaces for fast and seamless integration with existing networks, business processes, and e-commerce applications. 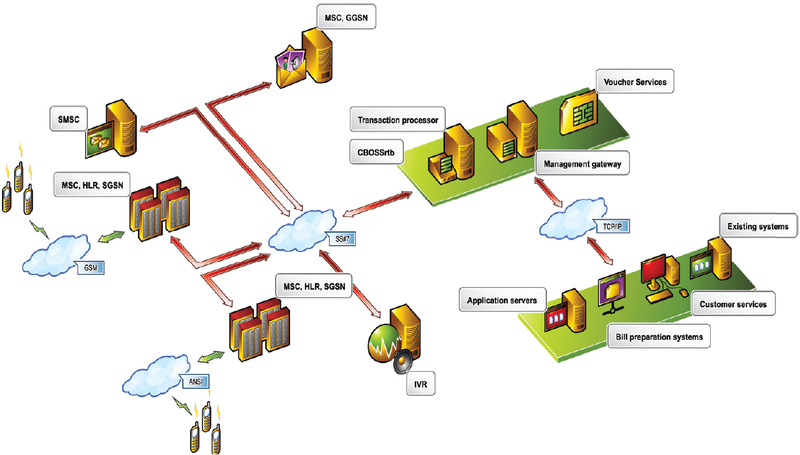 Flexible architecture of this product and sophisticated application programming interfaces ensure integration with third party billing systems, for example Amdocs. CBOSSrtb integration with the automatic customer care system CBOSSacc allows a service provider to arrange outbound notification and provide subscribers with a convenient interactive self-service tool. In particular, CBOSSacc provides an easy-to-navigate voice menu enabling users to rapidly get their account balance, register scratch card payments, etc. CBOSSacc’s outbound notification capabilities allow a telco to automatically inform users of the low balance, available resources, etc. For subscribers, CBOSSrtb provides the convenience to use innovative services anytime and anywhere, with a subscription type that best suits an individual’s usage behavior. For example, with hybrid accounts, subscribers can vary their payment method according to the service or usage moment. Proactive customer care, including information on account balances, bonus points and marketing campaigns, is ensured with USSD and SMS notifications as well as voice announcements. Moreover, subscribers can choose among numerous convenient ways to recharge their accounts, update their user information and view their usage records. The future-proof solution provides top performance, high reliability and practically unlimited growth potential. Exceptional scalability of the system allows for hosting the service for several service providers without compromising the reliability of the network service. With a typical traffic model one full transaction processing node is able to serve over 100 million subscribers in real time. As multiple nodes can be clustered the processing capacity is practically unlimited. The unbeatable scalability and fault-tolerant computing platforms ensure the lowest Total Cost of Ownership (TCO) and protects your investment. With the response time less than 100ms CBOSSrtb is a true real-time system.